Mardi Gras! Galveston and Yagas Entertainment will provide you with a unique opportunity to ride on a Mardi Gras float and party like a VIP at a balcony party with your friends and family! Cost? $175 per person to experience Mardi Gras as you’ve never seen before! What’s all included with the ticket? Credit card payments: Your credit card will be charged at the time of purchase. Unforeseen circumstances beyond Yaga's Entertainment, Inc. control will not be grounds for a refund, including but not limited to the following: local or national weather conditions and natural disasters, family emergencies, and/or medical emergencies. Balcony Parties are 21+, anyone under the age of 21 can only enter with their legal parent or guardian. A complete Krewe packet will be sent to your Krewe Captain upon payment. 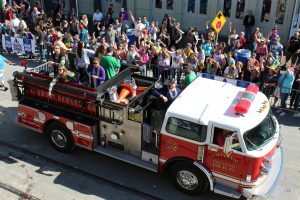 All Krewe members must fill out and return a signed liability waiver to participate in the parade and balcony party. Floats are available on a first come first serve by payment basis. I agree to the terms and conditions stated above. I am stating that the above information is correct to the best of my knowledge. 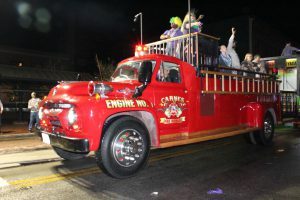 A parade packet will be mail to the “Krewe” Captain containing the information packet for parade staging and wristbands for the group to enter the district, balcony party, and ride on the float. Take a ride through all the action Downtown! 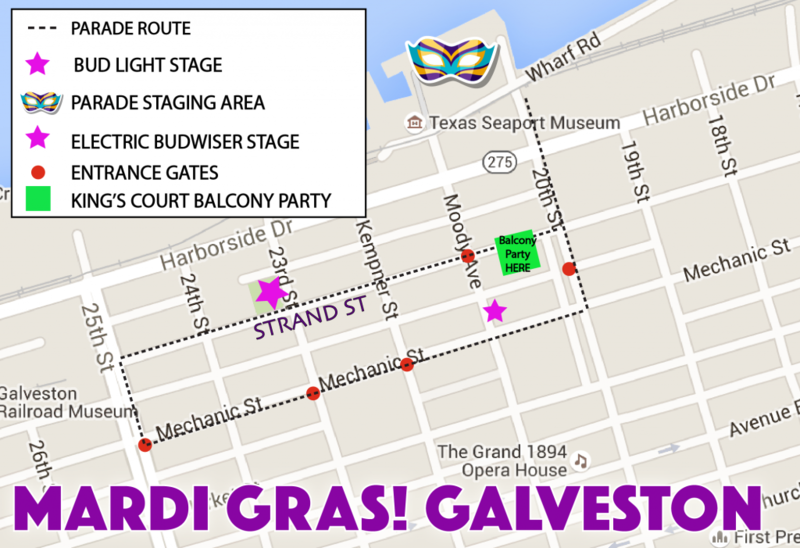 All parades stage on Pier 21 and enter the Entertainment District on 20th St. & Strand. Floats roll on down to make a double loop on Strand and Mechanic Street, ending back on Pier 21. The parade ride is approx. 40 minutes long.